When Waitrose ran a campaign called ‘Bake It Forward’, which was all about baking something for someone who you wanted to thank, then asking them to continue the good deed by doing the same for someone else they know. (And therefore starting a chain of baking joy!) I decided to join in by making these Mince Pie Bakewell Squares after discussing a mutual love of mince pies with a colleague of mine. 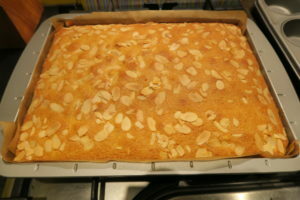 I made Apricot Bakewell Squares earlier this year and they were delicious. We both agreed that replacing the jam with mincemeat would be a fantastic festive twist! Seen as she loves mince pies so much I baked these Mince Pie Bakewell Squares for her as she is supportive and helpful colleague who certainly deserves these tasty treats! 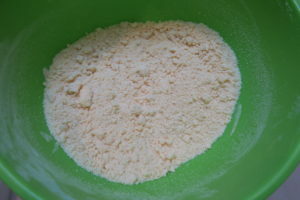 To make the pastry I rubbed butter into plain flour and caster sugar. 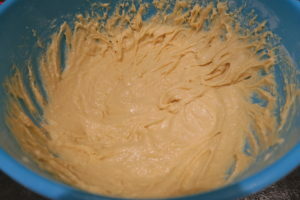 I added cold water and brought the mixture together to form a dough. 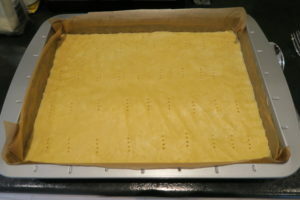 I tipped it into a lined baking tray and spread it out in an even layer and pricked it with a fork. Then I put it in the fridge for 30 minutes. Then I baked it for 10 minutes. 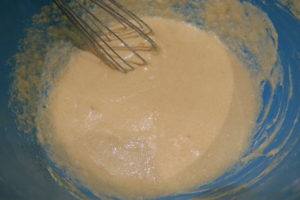 To make the sponge I first creamed butter and golden caster sugar together. I whisked in eggs and almond extract. 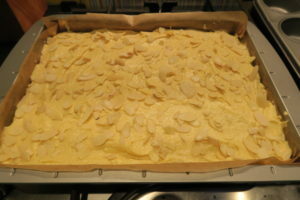 Finally I folded in ground almonds, baking powder and self raising flour. I spooned a jar of mincemeat over the part baked pastry. I always use a good quality mincemeat and one with brandy or cognac in it because I think it tastes nicest, or you can make your own, Waitrose have a good recipe for it. 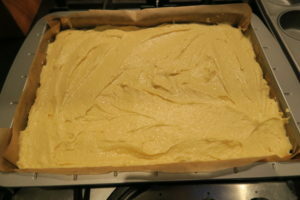 Then I gently spooned the sponge over the top and spread it out. I sprinkled over some toasted flaked almonds. I baked it for 35 minutes until it was a lovely golden brown. When it was fully cool I mixed icing sugar with water and piped it over the sponge in a zig zag pattern. 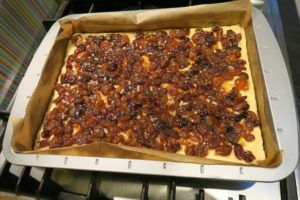 The Mince Pie Bakewell Squares were really delicious and certainly improved by the good quality mincemeat – hello brandy! I was really pleased with them and so were my colleagues, I got a lot of good feedback. They are certainly an interesting twist on mince pies and a great way to feel festive. You can find more of my Traybake recipes by clicking here! Or click here for more Christmas recipes! These are a great twist on the traditional mince pies for Christmas. I hope your colleague gets to try them as I'm sure she will be impressed! 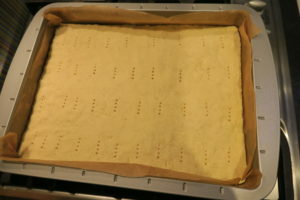 They look lovely, I can almost taste them! I am so in agreement with you about the mincemeat… though never understood why it was called mincemeat… really put me off when I was younger, even though I loved it! Apparently it's because they used to actually have meat in them! That's what I've heard anyway. I've only just learned to love mincemeat in the past few years. I would now love these! Snap! I've just posted something really similar! Tastes fab! That looks absolutely gorgeous, I'm going to make some of these.